Like the idea of drone photography, but been left a little wanting by the small sensors most drones feature? DJI and Hasselblad have the answer, in the shape of a 100MP integrated photography platform. 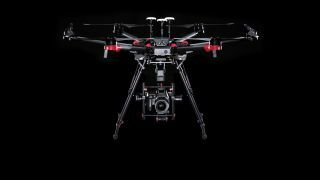 The drone maker and high-end camera brand have joined forces to team a DJI M600 Pro drone with a Ronin-MX gimbal and a Hasselblad H6D-100c medium format digital camera, to deliver what promise to be the most detailed aerial images available right now. The DJI M600 Pro drone is an adaptable six-rotor drone that sports a dustproof propulsion system and six intelligent batteries. That's not forgetting the sophisticated D-RTK GNSS navigation system, which provides enhanced accuracy over typical barometer, compass and GPS systems. Hasselblad's flagship H6D-100c, meanwhile, sports a large 53.4 x 40mm 100MP sensor (to put that in perspective, a full-frame sensor measures 36 x 24mm), with the camera mounted on the drone using the Ronin-MX three-axis stabilized gimbal. Camera settings can be continuously controlled in flight using the DJI GO app. The rig will be available later this year, with pricing to be confirmed – but with the H6D-100c alone nudging over £28,000 / $32,000, you're going to need to have some deep pockets.